If you saw my previous post (Crazy Crafters Blog Hop of 8 May), you may remember that I made a split card using a Botanical Builder framelit and didn't want to waste the leftover piece of beautiful cardstock. Can you see where that leftover piece ended up? The Affectionately Yours DSP is so beautiful, I couldn't bear to throw away any leftover pieces! I'm continuing to #loveitchopit with the Affectionately Yours DSP - particularly this gorgeous copper paper. I layered it onto a card made from Early Espresso cardstock (11" x 5.5" folded in half). I found myself hankering for some metallic copper card so, lacking it, I made my own by cutting a piece of Cajun Craze cardstock with one of the Project Life Cards & Labels framelits. I then inked all the edges with Versamark and heat embossed them with my new addiction - the new copper embossing powder to be released in June. I heat embossed the flower from You've Got This in copper onto Early Espresso cardstock and used a Basic Black Stampin' Write Marker and a Blender Pen to add shadowing to the flower. Then I cut the layer a little smaller than the copperised layer and adhered the leftover piece of DSP before round cornering the edges. Then I adhered the Early Espresso layer to the Copperised layer and glued it to the card front. I added some small Rhinestone Jewels for extra glamour. 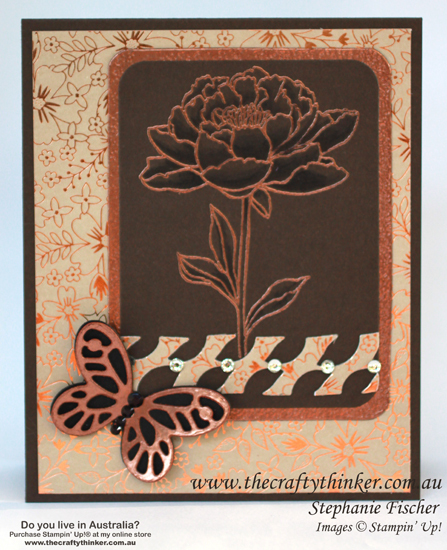 I cut a Basic Black butterfly with one of the Butterflies Thinlits and cut the matching filigree butterfly with a Bold Butterfly Framelit from some more "copperised" Cajun Craze cardstock. I coloured some more Rhinestone Jewels with a black Sharpie and added them to the body of the butterfly. I "copperised" pieces of Cajun Craze cardstock only because I already had it on my work table - I'm pretty sure any cardstock would do the trick. Nor does it have to be copper - silver or gold would look beautiful too!